I've trained for 18 weeks through 4:15 wake-ups, single-digit temperatures, hundreds of miles, 50+ hour work-weeks, snow, sleet, and freezing rain. While it wasn't the perfect training cycle, I persevered through many difficult situations. I added in a ton of elevation gain in preparation for my MS Run The US relay segment and also several new trail running routes. 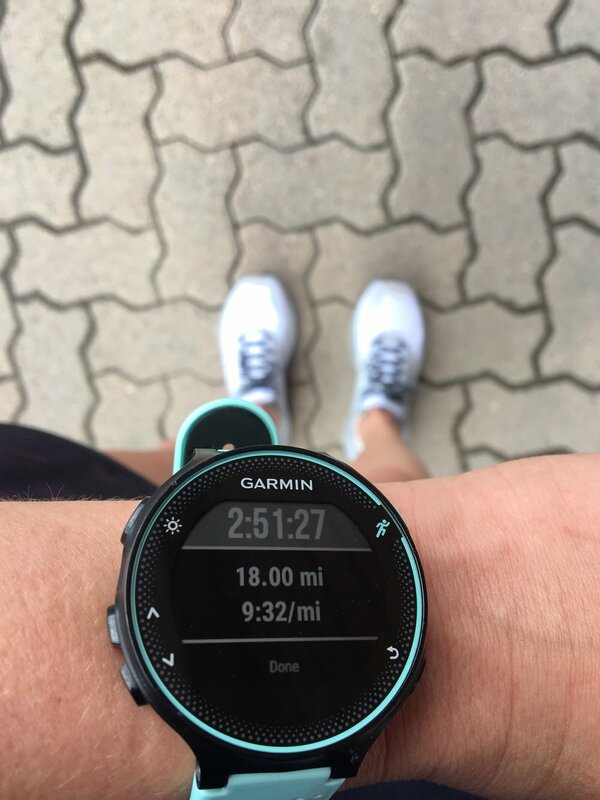 I tried to push myself with paces that I previously never held and overall, had really strong tempo (marathon-paced) training runs compared to my build-up to the Rock 'n Roll Las Vegas Marathon in November 2017. One of my most defining moments through this training cycle was my last strength training workout where I did 6 x 1 mile repeats and finished my last mile repeat in 7:58 and felt strong the entire time (not exhausted or out of breath). I also dealt with a few minor injuries that either forced me to take a day or two off or cut-back on mileage/ pace or rearrange my schedule until it felt better. I never once had to take a week off, but also focused A LOT on the recovery extras. Tart cherry extract, epsom salt bathes, ice, foam rolling, and icy hot ALL became my best friends. I added in foam rolling twice a day (morning & evening), as well as really focused on strength training (especially as my mileage got into high 50/ low 60 each week). I fit in strength work three times a week and while yoga wasn't as prevalent as I would have liked it, I still consider everything else I managed to accomplish a win. I had two headcolds (one turned into a sinus infection) and cut-back on mileage a bit during times when I wasn't feeling 100%. I think these small changes made a big difference in me still showing up at the start line feeling strong. A day or two off doesn't make-or-break a training cycle, but it can shake your mentality if you let it. Overall, I'm feeling excited and ready to be running another 26.2 in a NEW state on Saturday and will be posting my goals for the race on Friday (so make sure you check back then)! We will be leaving Steamboat around noon on Friday and I'm planning to hit up the expo as soon as we arrive in SLC and get to bed at a reasonable time before the 7am race start on Saturday!